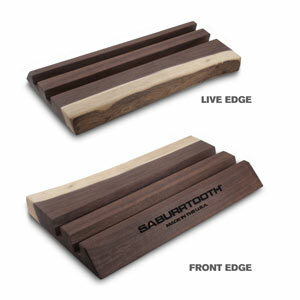 Hand-crafted, one-of-a-kind storage display for your Saburrtooth tools. Carved with the Saburrtooth logo on one side and a live edge on the other, each one is a uniquely beautiful work of art. Approximate Dimensions ~ 12" X 5.5"
This display will hold up to four 4" Wheels. Actual display shipped WILL differ from displayed photo, as each display is individually created. Limited supplies are available. SIGN UP for monthly Saburrtooth news bits and savings! You can edit this placeholder text by editing the "EmptyWishListText" topic within the Admin Console.